Speakers for Alumni Homecoming professional development sessions! 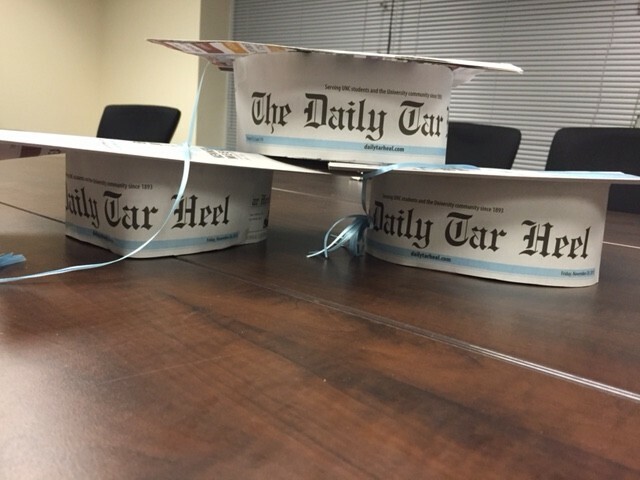 Many DTH alumni like to say they graduated from the DTH instead of UNC. Caps by design editor Jose Valle. The DTH Alumni Association is excited to announce the speakers for our training/professional development sessions for our Feb. 19-20 Alumni Homecoming. They will be held from 2:30 to 5:30 p.m. Friday and from 9:30 a.m. to 12:30 p.m. Saturday in the Freedom Forum Conference Center at the UNC School of Media and Journalism. For a complete schedule of the weekend events, go here. Buy tickets here. Shannan Bowen, audience strategy director, National Journal for Atlantic Media. The temperature on college campuses is high these days, with activism on sexual assault and race relations and questions about big-time athletics making news nationally and here at UNC. Current and former DTH staffers will talk about the coverage. Ishmael Bishop, editorial board member, moderator. The days when reporters were told to always stay out of the story are over. The personal essay is an important story form that has found new life in the digital age. But it’s important to stay fair, report and research the hell out of your topic and steer away from self-indulgent writing. Young alumni Eric Garcia will discuss how he wrote a personal essay on being a reporter on the autism spectrum for The National Journal. Eric Garcia, reporter, Roll Call. We know that it’s not enough to produce a print or digital product and expect readers to find it. It’s not enough to get clicks based on misleading or salacious headlines. News organizations must find a way to produce journalism that captures the attention of audience and brings that audience back. As the business model for producing good journalism changes, news startups are experimenting with ways to produce news and reach audience, often outside the rules and traditions of a legacy news organization. We’ll look at the ways startup culture is changing journalism, and how journalists can have an impact on technology companies. No one who pays attention to digital news can have missed the Post‘s redesign, efforts to reduce page-load time and competition with the New York Times to be a dominant national news website. Learn about the strategy, new products and more from homepage editor Sharif Durhams. Considering freelancing? You probably already know how to take pictures, design graphics or report stories like a pro. But the journalism is only the beginning. Listen to freelancing pros talk about how to find and keep clients, handle your taxes, pitch project ideas and more. Kevin Schwartz, Schwartz Media Solutions. Mike Ogle, reporter whose freelancing clients have included the New York Times, Sports Illustrated and ESPN.